Posted by Tantumblogo in Basics, foolishness, General Catholic. As Sacraments go, there are two that are intended to be a regular part of our lives. While we only get baptized and receive Holy Orders once (and married once), Confession and Eucharist should be something that we do regularly. The Church mandates that we attend Mass at least weekly, with the idea being that we will be in a state of grace and be able to receive our Lord in the Blessed Sacrament. But, because we are frail human beings, and all of us sinners (me being one of the worst), we may tend to cut ourselves off from God’s saving grace through our sinful actions. It being a very grave sin to receive the Eucharist unworthily (i.e., in a state of mortal sin), we should all avail ourselves of the Sacrament of Penance regularly. 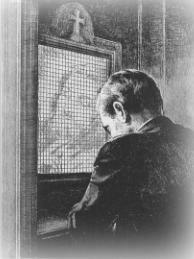 Since I’m such a terrible sinner and unworthy of God’s grace, I go to confession almost every week. One veteran priest says he hardly ever hears confessions and hasn’t had a single person come to the Wednesday night sessions – “which I consider the sign of a healthy parish.’ The priest, who asked not to be identified because he doesn’t want to alienate the archdiocese, says he thinks that many Catholics today have a more modern view of forgiveness. Oh, a more modern view of forgiveness? What a load of tripe. There is no “modern” view of forgiveness, just like there is no such thing as “modern man.” Both were tropes dreamed up by dissenters to justify their deviation from established Church doctrine. 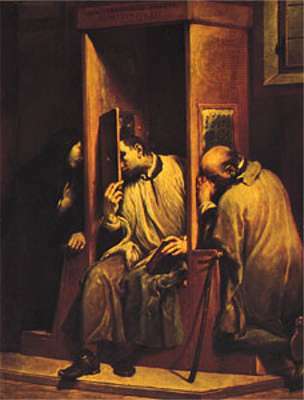 After Vatican II, many working with its ‘spirit,’ decided that man was now oh so sophisticated that he didn’t need silly, superstitious, medieval practices like confession and adoration. No, we could be like the protestants (which was the goal), and just go ‘straight to Jesus’ for all our needs. Too bad this discounts not only 2000 years of Church tradition, but also plain exhortations from Sacred Scripture. James 5:14-17 and John 20:21-23 form the Biblical basis for this Sacrament, but it was also common practice in OT Judaism to publically proclaim one’s sins before the priests. Since the Catholic Church is the perfection of the Old Testament covenant, it makes sense that similar practices, perfected, would continue. There are also great practical reasons to confess your sins to a priest. For one, some will say “I just have to confess my sin to Jesus and I’m good,” but when was the last time they actually did so? Secondly, having to say your sins out loud to someone else, especially an authority figure you respect, is a powerful deterrent to future sin. Third, the feeling of release and forgiveness after the priest says “I absolve you of your sins in the name of the Father, and of the Son, and of the Holy Spirit…..” is incredibly powerful. You don’t get that when you do a self-confession. Finally, confessing your sins regularly tends to make one more aware of sin in general, and you become aware of deeper levels of sin that need to be cleaned out. This is a process of sanctification through God’s grace. In truth, what the priest above has is not a modern vision of sin, but a lack of faith. He’s broken faith with the Church and with Christ. Christ didn’t waste any words. When He said “If you forgive the sins of any, they are forgiven, and if you retain the sins of any, they are retained,” He meant it. He also meant for us to make use of this Sacrament regularly. The priest above, and apparently many in the Boston diocese, have lost the understanding of what sin is, and many are probably mired in mortal sin without being aware of it. Pray for them – if such is the case, their very souls are at stake. Posted by Tantumblogo in Abortion, General Catholic, scandals, Society. So, Sr. Keehan equates children being uninsured with being anti-life, in some way. Her figures are dubious, the numbers thrown around by the supporters of Obamacare have already been taken apart elsewhere. I have no idea what she means by “it’s hard to be pro-life when we don’t give many mothers who are pregnant care.” First of all, who isn’t giving mother’s care? Those opposed to a government run single payer system, which has been CHA’s goal all along? What about those opposed to a single payer system, who generously support pro-life non-abort crisis pregnancy centers, like White Rose? Are they still pro-life? Who put Sr. Keehan in charge of deciding what is pro-life or not? Does the fact that government run healthcare, everywhere in the world, rations care, and thus may wind up forcing abortions on women who have a particularly difficult pregnancy because it’s not cost effective to do otherwise even enter into her thinking? Is it pro-life to have a government run system that only gives palliative care to large swaths of very sick seniors, because their high cost health care drains the government run system of limited funds? Those who argue semantics that “Sr. Keehan didn’t say that those who oppose Obama’s nationalized health care plan are not pro-life” are being disingenuous. From the beginning, CHA has most definitely supported whatever you want to call Obamacare – I have received mailings from CHA advocating that I contact my congressman insisting they pass the pending legislation, at periods of time when that legislation contained language massively expanding abortion in this country (this began last July, continued in August and September, and into October. This effort is still ongoing). Sr. Keehan has made it plain that CHA seeks legislation that will provide 100% coverage for all Americans. The preferred CHA way of achieving this is with a government run system, and the only way a government run system can cover everyone is to limit treatment options. Sr. Keehan and CHA have repeatedly refused to address this fundamental factor of government run health care, and tend to act as if it doesn’t exist. In the present political context, arguing in favor of 100% health insurance coverage for all Americans is the same thing as arguing in favor of Obamacare. Go to the CHA website, and see their “photo gallery,” using the same “We can’t wait for health care reform” message that the Obama administration and the Democratic National Committee have been using for months. CHA is completely wrapped up in promoting the administration’s agenda when it comes to health insurance takeover reform, and to argue otherwise is to be disingenuous. Their entire website is like a giant lobbying program for the proposed health care legislation. When Sr. Keehan says “We have nine million uninsured children in this country. That’s not pro-life,” the message is, “If you don’t get on board with nationalized health care (Obamacare), you’re not pro-life.” She has to know that’s the message that will be received. And in her desperation, she said it anyway. CHA and Sr. Keehan have obstinately refused to address the fact that they have a very powerful vested interest in Obamacare being passed into law – the many billions in additional revenue they will receive as one of the major medical providers under such a system. They have also not addressed the fact that CHA and its affiliate organizations, nominal charities, have made billions in profits, largely from government contracts, in recent years. As I’ve related before, many Catholic charitable groups have come to depend on government funding. They like that government funding, because it’s always there and it’s alot less hassle to raise. It’s not undependable like private donations, which vary according to the performance of the organization and market forces. Just days after starting a campaign to promote Obamacare, Catholic Charities received a $100 million grant from the federal government. I’m sure it’s just a coincidence. All this is just smoke to confuse the point. Sr. Keehan is attempting to promote doubt in the minds of very faithful Catholics that their opposition to this prudential issue of “social justice” is somehow bound up in issues of grave moral concern like being against abortion. That is a despicable tactic. Catholics are free to agree or disagree on issues of social justice, to determine what they think is the best way to provide for the broad range of needs represented by that cliched term. Catholics are not free to decide on their own whether abortion or euthanasia are grave moral concerns – they have been defined as always and everywhere evil by the Church. What those who so strongly support nationalized health care often do, however, is to try to apply the completely discredited “seemless garment” argument to allow them to support an intrinsic evil, like abortion, if it gets them want they want, a socialized medical system, and eventually, a socialistic economy in this country. This is no “meme.” And Sr. Keehan’s jedi mind trick won’t work. Posted by Tantumblogo in Dallas Diocese, General Catholic. While I’m hitting local topics this morning, let me remind all that the Bishop’s annual Pro-Life Dinner is April 10th at the Hilton Anatole Ballroom on I-35 (Stemmons), southbound side, at Market St. A silent auction starts at 5, and the dinner at 6:30. Tickets are $75 each, but they’re for a very good cause, they go to fund the Catholic Pro Life Committee of Dallas, which funds all kinds of pro-life efforts in the area. My wife’s been several times. You may have an opportunity to bid on something your humble scribe makes, I put something up for auction a year ago. Posted by Tantumblogo in awesomeness, Dallas Diocese, General Catholic. The White Rose Women’s Center is celebrating it’s 25th anniversary. To celebrate, a Mass is being celebrated at St. Thomas Acquinas in Dallas on March 17 at 7 pm! Yes, that IS St. Patrick’s day! And, there is a reception afterward, so you can get your drink on if you’re so inclined. Bishop Farrell is celebrating the Mass, so maybe afterwards at the reception, you can challenge him to duelling shots of Jameson’s. I wouldn’t recommend it, tho, he is from the Emerald Isle. Kidding aside, kudos to Bishop Farrell and all involved for celebrating this significant milestone for White Rose. With two locations adjacent to abortuaries, White Rose does wonderful work helping women in troubled pregnancies to choose life. It’s a great organization to support with your charity. If you can’t make it to this anniversary Mass, would you consider supporting White Rose with a gift from your generosity? Click below for the information flyer on this event.